How to help the students to improve their digital, civic and social competences? Which tools can support teachers in their daily work in class? 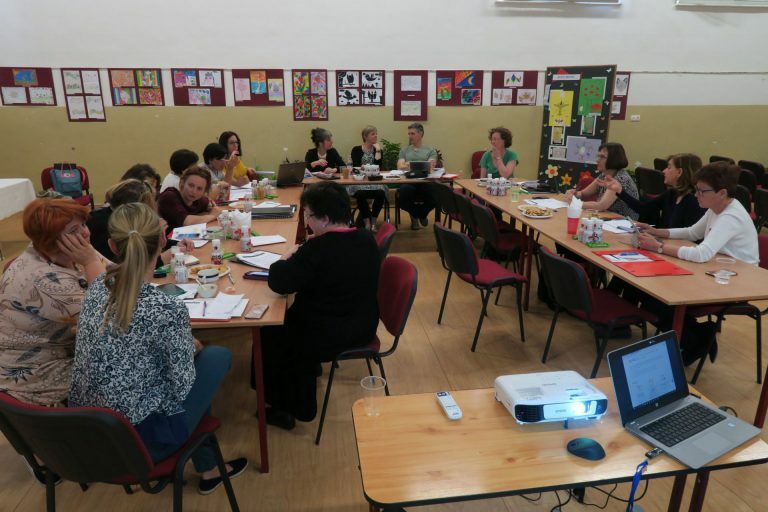 The final meeting of the MYSTY project was held in Budapest from 18th to 21st April 2018. The project partners met for the last time at the Baross School to finalize the last details. It has been very interesting to know the Baross schools education programmes which is considerable, art education is also prominent, choir, instrumental music and drama classes work effectively and highly popular among students. The first day of the Meeting, the students welcomed us with an intercultural performance in which a group sang and danced music presenting different cultural contexts and some students performed performing musical instruments. the Website with the Digital Storytelling Toolbox. All partners have discussed on the future and sustainability of the project, as well as having the opportunity to visit Budapest, the capital of Hungary. The Hungarian partner was very welcoming and friendly, the visit of the city by boat through the Danube was very appreciated. The project ends on the 31st October but the consortium will continue to equip the schools of skills with a path of integration and interculturality. On the project website mysty.eu you can download the Guide to students for digital storytelling to follow the step of creating a digital story. MYSTY project – MyStory: Digital Storytelling Toolbox for Diversity in Schools is funded by the Erasmus + program – Key Action 2: Strategic Partnerships Schools and aims to create innovative tools for pupils and teachers – specifically, digital storytelling – to share and introduce such teaching practice to enhance awareness on diversity within the school environment.